Visit our page and find beautiful Eco friendly jewelry made of Tagua Nut. 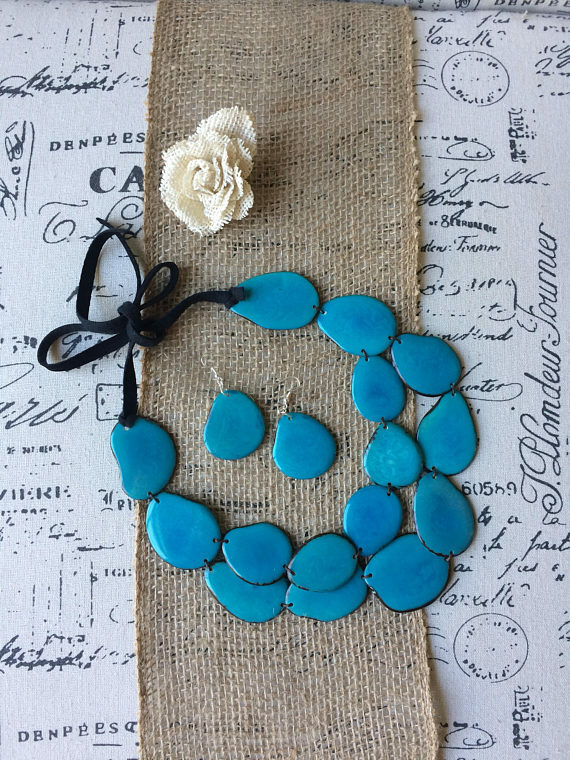 Here you will find unique jewelry, just like this Turquoise Layered Necklace Set. This stunning Eco friendly jewelry set is made of thin Slices of Organic Tagua that have been manually carved, dyed and polish to bring to you this lightweight, yet very resistant pieces. This set has a bib adjustable necklace, with leather straps, that go up to 22 inches long approximately. The dangle earrings are about 2 inches long (4 cm). The beads have been sewn together with waxed cotton cord. This set is very versatile, and will add character to any outfit you pair it with. Without a doubt is the perfect gift for any occasion! All of our jewelry has proudly been made in Ecuador by local artisans.